Step-down DC/DC power modules from Texas Instruments (TI), available from Mouser Electronics, now include the LMZM23600 and LMZM23601. 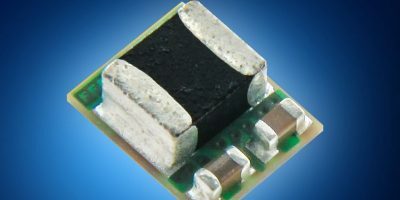 The power modules are housed in a compact MicroSiP, measuring 3.8 x 3.0 x 1.6mm. According to Mouser, the modules can reduce board space by up to 58 per cent, making the LMZM23601 the smallest 1.0A DC/DC power module on the market for industrial applications. TI’s 0.5A LMZM23600 and 1.0A LMZM23601 power modules are available from Mouser Electronics in a fixed-output voltage of either 3.3 or 5.0V or with an adjustable output voltage of 2.5 to 15V. The modules feature an integrated inductor and an input voltage range of 4.0 to 36V with up to 92 per cent efficiency to minimise energy loss. The modules’ 30 microA quiescent current increases light load efficiency and extends battery life in battery-powered applications. The LMZM2360x power modules require only two external components for fixed-output voltage performance, and support a seamless transition between forced PWM mode and auto PFM mode, enabling both constant-frequency operations and high-efficiency operations with light loads. The LMZM23600 and LMZM23601 modules are optimised for low-EMI, performance-driven industrial applications and include built-in control loop compensation, soft start, current limit protection, and under-voltage lockout. TI’s LMZM2360x modules are supported by the LMZM23600 and LMZM23601 evaluation modules, which are available assembled and tested. The modules allow developers to evaluate the features and performance of the power modules. The LMZM236000 evaluation module is available in all three output voltage options, while the LMZM23601 evaluation module is available in an adjustable 2.5 to 15V version. The LMZM2360x power modules are suitable for space-constrained designs such as sensor transmitters, grid infrastructure, field transmitters, ultrasound scanners, and network security cameras, advises Mouser. Mouser claims to stock the world’s widest selection of the latest semiconductors and electronic components for the newest design projects. Mouser Electronics’ website is continually updated and offers advanced search methods to help customers quickly locate inventory. It also houses data sheets, supplier-specific reference designs, application notes, technical design information, and engineering tools.